Gardeners don’t grow old – they just Spade Away! It all began with a cucumber! I planted my first garden in Rock Hill, South Carolina in the spring of 1969. I was 27 years old, had just had my first child, and wanted to try growing some of our food. Have you ever seen a teeny-tiny cucumber as it emerges just behind that bright yellow flower? It’s magical! I was enthralled. Later that summer there was a cantaloupe. I think it was called Ambrosia. Certainly that is what it tasted like. I was hooked! That very first homegrown cantaloupe is still remembered as the best ever! I did not grow up in a gardening family. But I did grow up in a time when kids were encouraged to be outdoors, sometimes from morning till evening, exploring in the woods and fields near our home just outside Allentown, Pennsylvania. We camped and hiked, skated and skied, swam and biked. 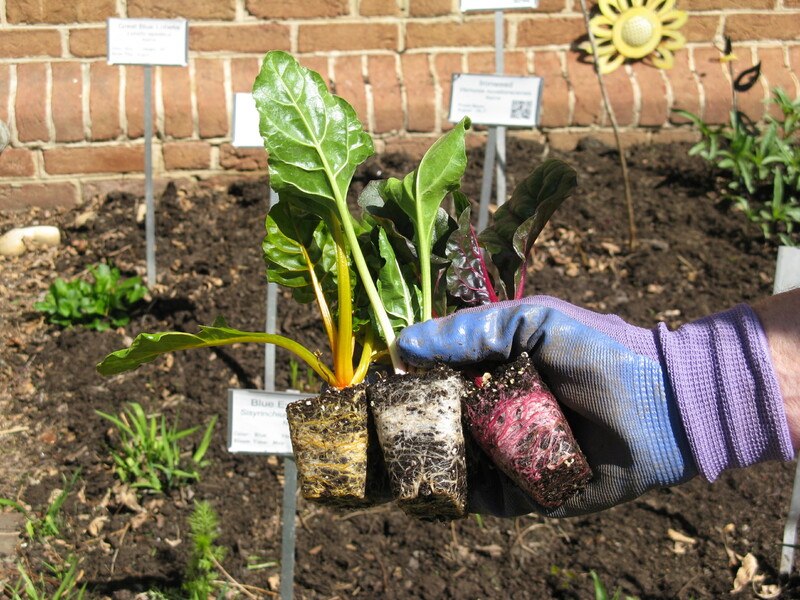 Being physically active is part of who I am, but it was not until I found gardening that I found an activity that gave back to me as much as I gave to it. After 21 years as a Master Gardener and lots of earlier garden experiences, here are some things I’ve learned. 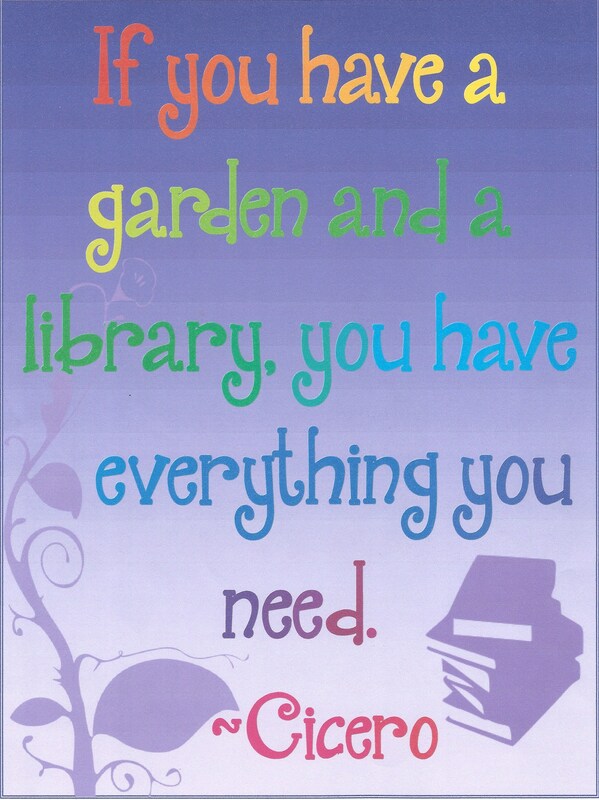 I’m calling them Lessons from the Garden. Some of you may be the same. You need to be in the garden, you need to take a walk and touch trees, you talk to your plants, you tend them with care, you try to keep them fed and watered, you tell them they are beautiful. You bring them into your home: harvested as food, cut as flowers or herbs, bringing sustenance, flavor, fragrance and beauty in. This relationship is important to your livelihood. Lesson No. 2 – Mahatma Gandhi said, “To forget how to dig the earth and tend the soil is to forget ourselves.” The lesson I take from this statement is that digging the earth and tending the soil is about tending our deepest selves – that tending deepens true self, fills us with energy and joy, and leads us out of ego-self and into relationship. Earth tending builds the capacity for caring relationship. Carolyn Rapp & Judy Funderburk at the Glencarly Library Community Garden. It took some years and the opportunity to tell my “garden story” to my friend and gardening partner Carolyn Rapp to realize that not only do I get energy and feel joy from being in a garden, but my energy and joy are taken to a higher level by sharing the garden with a friend. Carolyn was interviewing me for a chapter in her book titled Garden Voices, Stories of Women and Their Gardens, when I slowly realized that for me being a gardener and a lover of the earth has always been about relationship – with plants AND with people. The Garden Voices chapter about me is titled “Tilling the Soil of Friendship.” I am most happy when in the presence of plants, trees and earth – and, sharing my care and love for plants, trees, earth with others multiplies the joy. How many of you have noticed how animated and talkative I get when walking folks around the garden? Lesson No. 3 – Having a garden keeps me learning and growing. I am connected to that which gives life . . . to the cycles of life/death/rebirth, of growing/flowering/ fruiting/seeding . . . I am immersed in the seasons of many beings and experience life as journey. I am on bended knees touching the Earth, but taught not to compact it, to pay attention to its nitrogen/ potassium/ phosphorus levels, to honor the threadlike fungi and mycorrhizae. Did you know that the word “humus”, that dark rich soil all gardeners hope to develop over time, is derived from a similar root as the word “humility?” Being willing to take the “clay” of our lives, the compacted places, and to amend these aspects of ourselves over and over again is the work of a gardener. The soil is my teacher. Turning it, though we are now told to do less of that, is a powerful metaphor. As I dig in, lift and turn compacted places, there is a corresponding opening inside encouraging me to “lighten up” and let go of the tightness with which I habitually hold life together. The seed knows how to become a sunflower given fertile soil, time, sun, and water. Winterberries needing to be thinned. Lesson No. 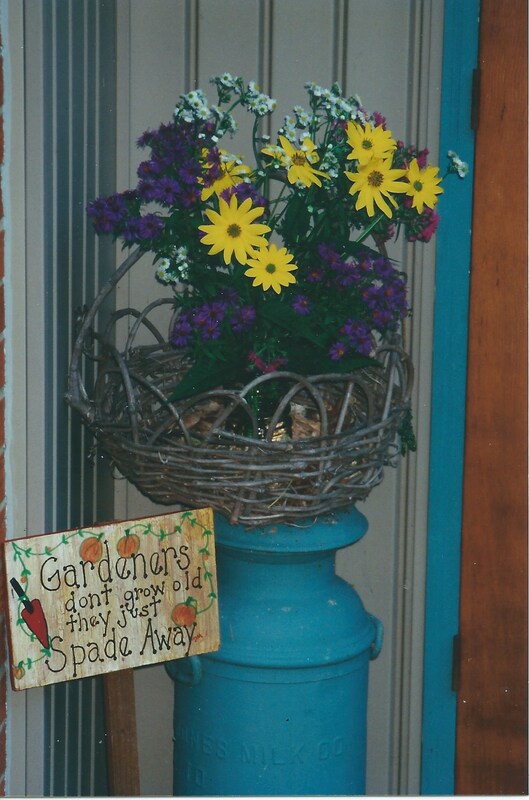 5 – Gardens are about change. Before the Library Garden, I had three different gardens and three gardening partners. There was the 10 years with Bonnie. We were in our thirties, our children were young and would play together as we turned over her backyard and made a vegetable garden that supplied us with those magical cucumbers, plus peas, corn, beans, tomatoes. Then, 10 years with John, who lived out near Leesburg, was 72 and had Parkinson’s when we started to garden together in an old paddock with great soil. John was a Quaker and a “contemplative.” Our garden time had a sense of ease and shared companionship. I was his helper as we planted peas, picked rhubarb, lettuce and zucchini, thinned carrots and cabbage. He saw in me that spiritual sense of the garden that I am unaware of on a cognitive level, a music and a sense of the plants’ energy that permeates my being. He particularly saw an ease in the way I move in the garden and told me I was “graceful” – a word no one had ever used to describe me before. Judy and John, mentor and friend. Carolyn Rapp at the Barton Street Community Garden. 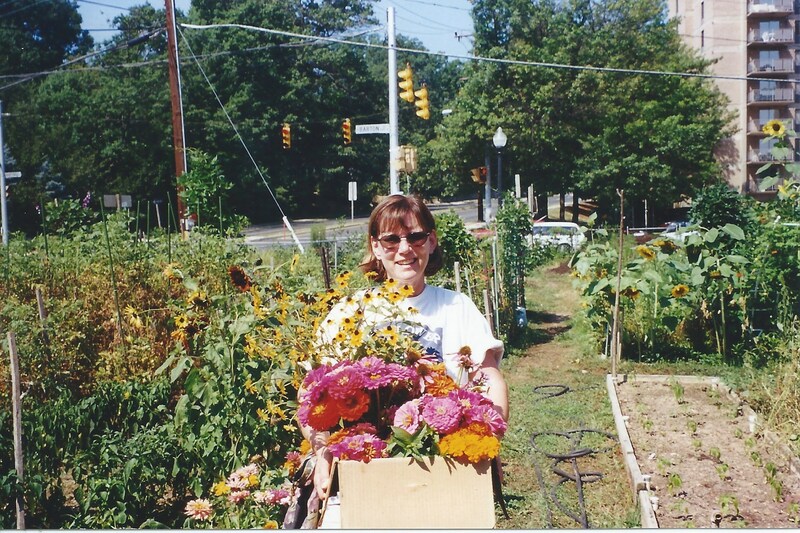 Then 18 years in the Barton Street Community Garden with Carolyn where we shared a garden plot, turned the soil and shared our lives in our 50s and 60s. This garden was different from any of my other gardens because it was not all about vegetables. Carolyn is a lover of flowers and creating beautiful spaces. She brought the magic and color of flowers into our gardening lives. I brought more of those magical cucumbers as well as most every other vegetable we could fit into our plot. Gardens change, and wouldn’t you know it, we do too! With the Glencarlyn Library Community Garden also a MGNV/VCE teaching/ demonstration garden, I find our work there has expanded my focus. Its emphases are broad – it regularly provides teaching to neighbors, library patrons, children from the Carlin Hall Pre-School, two elementary schools and Kenmore Middle School. It is divided into at least 10 unique mini-gardens, each with their own complement of plants and signage. We are certified by the National Wildlife Federation as a Wildlife Habitat and as a Monarch Waystation by Monarch Watch. I have had to change from one who loved small native ephemerals to one who also embraces bananas and cannas and elephant ears! It’s all good . . . and the pollinators and wildlife embrace our diversity. Lesson No. 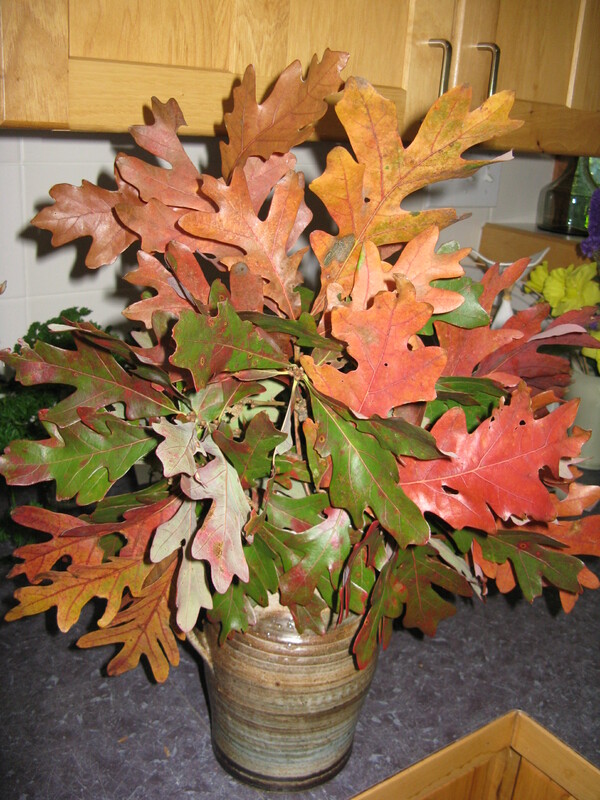 6 – Naming plants is my way of acknowledging a relationship with them. Being a Master Gardener has over time given me a fairly large plant name vocabulary. Even as a child, I liked naming and understanding things, but I have only recently realized that for me naming plants gives a sense of intimacy and caring relationship. Would any one of us have a friend we didn’t call by name! Naming is a way of saying: “Hello. I greet you. Seeing you brings me joy.” (Okay, I admit that is not always true … naming is not so caring if it happens to be the newest thug on the block: Mulberry weed Fatoua villosa, or Siberian elm Ulmus pumila). Another surprise learning from naming my garden friends is, that not only have I mastered a bunch of the Latin names, but feel a bit gleeful about rolling out the sounds of some of them. Saying Opuntia humifusa or Spigelia marilandica makes my tongue happy, makes me happy . . . I don’t know if it makes the plants happy, but I like to think they respond to being named in a smiley kind of way! Hello Trillium luteum – you are looking beautiful today. Greetings dear Fothergilla. Your fall dress is stunning with leaf hues in shades of orange, gold, red and plum. Map of the Glencarlyn Garden from the garden brochure. Lesson No. 8 – Gardeners make great friends. MGNV and VCE have supported me personally, providing a multitude of opportunities for growth and service. Master Gardeners have become part of my spiritual community where there is trust and humor and understanding and nurturing of gifts, mine and the gifts that grow between us as we garden – “tilling the soil of friendship.” This has been especially true with my gardening partners, first Paul, and then Paul and Alyssa, and now Paul, Alyssa, Elaine and Wendy. And, it also includes all of you who are part of this very special community of folks who love tending the earth, who care about sustainability, who share their love and caring in a multitude of ways – who feel like kin. I came home from the Garden late, tired, and trying to figure out what to make for dinner, when my nose started to drip. 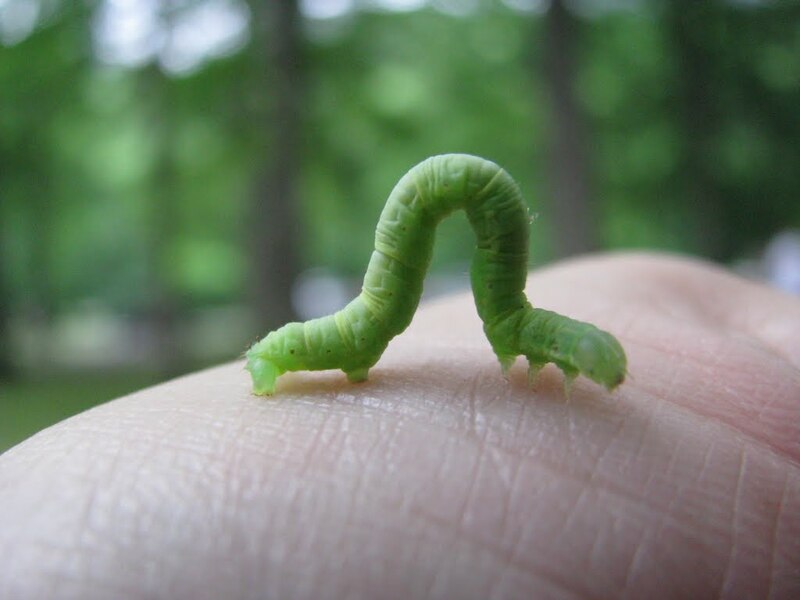 I reached in my pants pocket for a previously used kleenex, and pulled out not only the kleenex, but a lovely green inchworm that perked up and seemed to be looking at me with the question, “How did I get here? ” Jvic asked me if I had brought it home to put it in the soup!! We work together, we sweat together, we laugh together. How beautiful! Lesson No. 9 – Last & finally – No one can keep up a teaching garden alone! 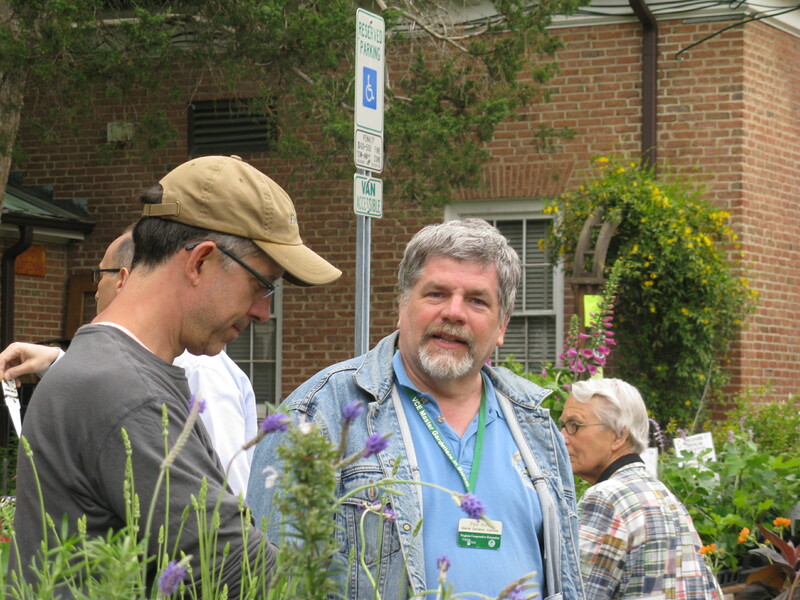 A thousand thanks to ALL the Master Gardeners, Interns and Community Waterers who have supported us and our Glencarlyn Library Demonstration Garden by showing up week after week to to do the work that keeps a garden growing. I continue to learn from so many of you. And I love that I now have more time for mentoring in the Garden. Your gifts of time and care and expertise transform the Garden on a weekly basis into a much-loved place of learning and beauty in our urban setting, where respite and peace are rare and are so needed.